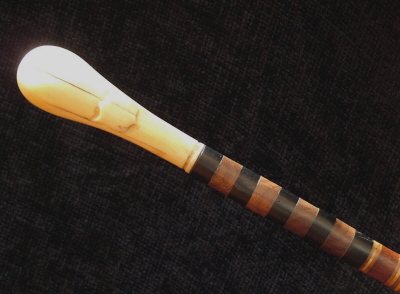 A lovely example of slim specimen wood cane on internal metal rod. The ivory carved pommel holding a shield shaped cartouche. The cane finished with a brass based metal ferrule. The length of the cane is in beautiful condition without missing wood samples, breaks or cracks. The ivory does hold a few expansion lines and little nibble of ivory from the lower base collar.